‘Encryption’—does this term ring any bells in your mind? Of course, it does. Granted, you may not have the most in-depth knowledge of encryption—not many do. But it’s also not as complicated as it might seem at first blush. You don’t need to be a cryptographic expert to understand or even implement encryption. Basically, Encryption is a technique by means of which your sensitive data is turned into an unreadable format. Whether it’s a website, an App, local files or even a USB flash drive, Encryption is used EVERYWHERE. 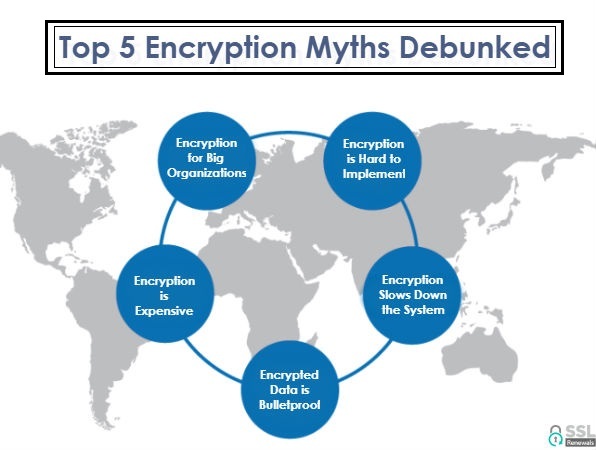 Unfortunately, there are some misconceptions surrounding Encryption which certainly don’t help. We are here to bust these myths and clear the air for you. Let’s begin the myth hunting!!! This is one of the most common myths associated with Encryption. This may have arisen from the fact that we only hear news of big organizations being targeted by hackers. This is again not true. In fact, small businesses are targeted more compared to the big boys. According to a study, 43% of cyber-attacks are targeted at small businesses. This is mainly due to the weak fortification of their systems–exactly what the cybercriminals are looking for. It doesn’t matter how small your business is, you still need encryption. Let’s talk about the most widespread use of encryption—SSL certificates. SSL certificates are installed on web servers to protect the data transferred back and forth between a web browser and the site it’s visiting. Many website owners still believe that it requires professional expertise to install an SSL certificate on their server. This is nothing but a myth. If you follow the instructions given by your SSL provider, you won’t have much problem installing it. And even if you do face a problem during the installation process, their customer support is there to help you. If you want to play it safe and don’t want to install by yourself, we can even do it for you at a nominal fee. Many people use this as an excuse against using Encryption. In today’s age, this argument doesn’t hold any water whatsoever. Desktop computers, mobile phones, and tablets can handle Encryption without showing any signs of lagging. This is down to significant improvements in processor technology in the last few years. These processors come with modern AES NI technology. This technology remarkably speeds up the encryption and decryption processes. It is estimated that the Encryption is done 3x faster while the speed of decryption is improved by tenfold. It’s true that cracking the cryptographic key is virtually impossible. Still, the perpetrators somehow find ways of breaching security. More often than not, this happens due to human errors. The main reason behind it is the mismanagement of keys. Many organizations store the keys at centralized places. Some users even use Cloud servers to store their keys. Both act as open invitations to the cybercriminals. Many users and organizations tend to stay away from Encryption thinking that it would be too expensive. Again, not true. On our website, you can get an additional amount of 71% discount on SSL Certificate. Granted, some of the other Encryption software and applications may seem costly at first. But you must think about the future. It’s an investment more than anything else. Imagine the cost if a data breach takes place. Forget about the lawsuits and your reputation, it could pose a risk on the very existence of your company. You certainly don’t want that, do you? Better not worry about the cost and deploy encryption on the system.